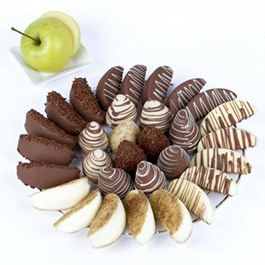 This platter is a variation of our Chocolate Platters. Loaded with Mini Cannoli, Chocolate Covered Strawberries, Mini Cheese Cakes, Eclairs and Cream Puffs or build a custom platter. Also available in 10, 12 & 14 inch platters.